Sunday Drivers was released in 1982. 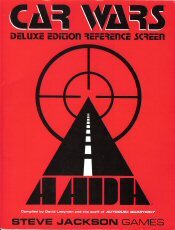 Re-printed as "Crash City" in 1985. They are the same game. 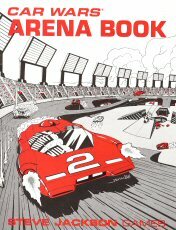 In fact, the rule booklet inside Crash City is titled "Sunday Drivers." "There's never a dull moment in Midville. Between tne local auto-duellists, the trigger-happy pedestrian group called the MONDOs, and the heavily-armed police, life can get pretty exciting. As if that weren't enough, the local cycle gang - Blade Jesse's Crusaders -would like nothing better than to burn the town to the ground. 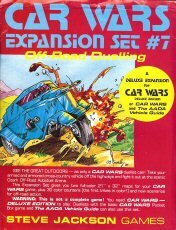 SUNDAY DRIVERS is a Car Wars supplement (you will need the original Car Wars rules to play). The game goes best with three to six players. Two scenarios are supplied, and players can easily invent their own scenarios using the 42" x 32" Midville street map. Game components include 160 full-color counters painted by Denis Loubet (police cars, the Ambunaught, cyclists, pedestrian, chain, police, MONDOs, and more); two 21" x 32" map sections; 24 pages of rules; ziplock bag for counters; and the plastic Pocket Box." "Since the publication of the original CAR WARS game, autoduellists everywhere have been demanding rules for the big trucks. Well, wait no longer. Here they are. TRUCK STOP is a Car Wars supplement; you will need the original Car Wars rules to play. TRUCK STOP gives you movement and combat rules for 18-wheelers . . . regular and wreck counters for a variety of big rigs . . . and a map of a typical fortified truck stop in the America of 2033. Components include 37 full-color counters painted by Denis Loubet, 24-page rulebook, 21" x 32" map, ziplock bag for counter storage, and the plastic Pocket Box." "This set contains extra counters for your Car Wars game - cars, trucks, buses, cycles, police cruisers, wrecks, tire spikes, dropped mines, smoke, paint, oil slicks, debris, pedestrians, and record counters - plus a Turning Key that makes even complicated Car Wars maneuvers easy! 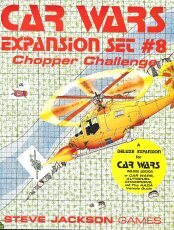 "A giant city map... and new vehicle counters... for the Car Wars fan who wants a truly BIG game. This set contains 31 vehicle counters (including two more police cruisers, and a new tractor and trailer for you truckers), an 8" x 14" rule and scenario sheet, and two 21" x 32" map sections. These combine into the 32" x 42" map of "East Midville" . . . which in turn connects to the Midville map from Sunday Drivers to form a truly mammoth (42" x 64") Car Wars map! You do not have to have Sunday Drivers to use this expansion set — but the whole background and two of the scenarios are based on Sunday Drivers. Therefore, if you don't already have that supplement, we suggest you buy it first." "The Armadillo Autoduel Arena has launched many adventurers on their quest for death or glory. 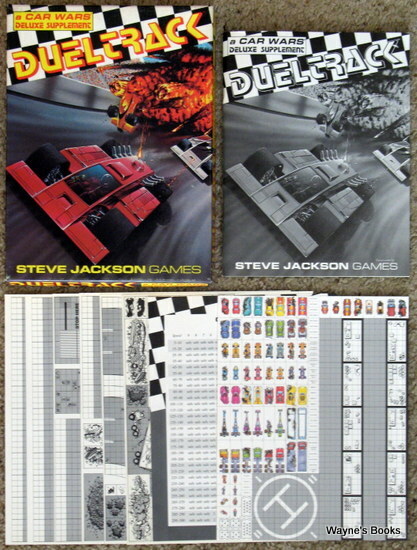 This set includes the 32" x 42" arena map; complete instructions; combat scenarios covering a week's schedule at the Arena; and 16 color wreck counters — one for each car in the original Car Wars game. To use this supplement, you must have the basic Car Wars set. The Sunday Drivers supplement will be helpful in understanding the background." "Over 150 black-and-white, color-them-yourself counters, ready for action! Create autoduell ing teams, corporate fleets, or vigilante groups . . . you can even put your personal colors on your favorite vehicles! And there are plenty of vehicles to choose from. Counters for every vehicle in The AADA Vehicle Guide, and many of the variants — 153 in all! Everything from subcompacts to buses, with motorcycles, trucks, trailers, and helicopters, too. And this set also includes trike counters, for three-wheeled combat on and off the roads! Should you come out second-best in a duel, each counter has a wrecked version of the same vehicle on the back. Just flip it over, and plot your revenge . . . 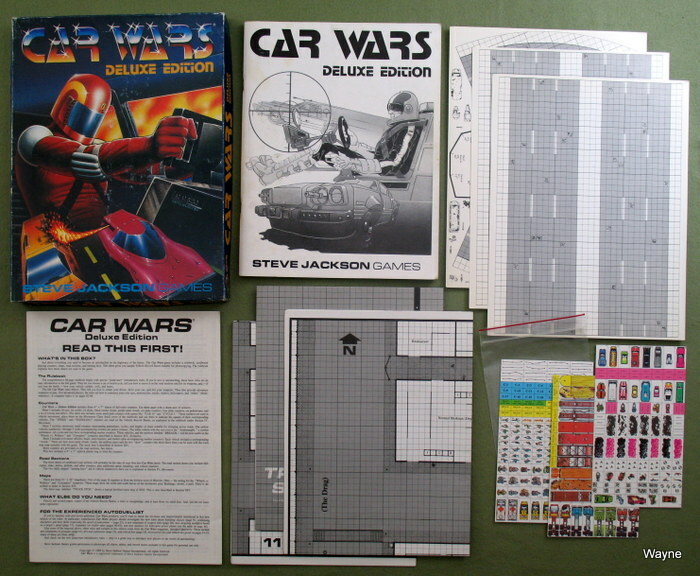 Car Wars Expansion Set 6 contains four 4" x 7" black-and-white counter sheets, printed on both sides; an insert sheet, which includes coloring advice and a complete key, listing each vehicle's name and where you can find it in the Vehicle Guide; and the ziplock bag it all comes in." 2nd printing (1990?) 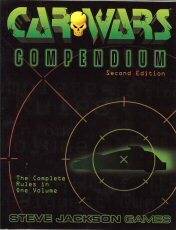 exchanged the stapled rules booklet for the Car Wars Compendium (SJG 7142) and added an ISBN to box cover. I've seen such a set with a Spring 1992 SJG product catalog. "CAR WARS is a game of combat on the freeways. Choose your vehicle — complete with weapons, armor, power plant, suspension, and even body style. Then take it out on the road. You'll come home an "ace" - or you'll crash and burn. If you survive, your abilities will improve, and you can accumulate money to buy bigger and better cars. Advanced rules let you design your own cars, cycles, three-wheelers, vans, trucks, 18-wheel tractor-trailer rigs, and helicopters!" "Huge. Invulnerable. Invincible. Awesome. A moving mountain of metal and firepower, untouchable and unstoppable. This is an armored fighting vehicle on the move. Like the Juggernaut of old, the AFV crushes all in its path. Car Wars Tanks provides complete rules for these vastly potent war machines. Build any kind of AFV, from humble mini-personnel carriers to giant hundred-ton super tanks. Weapons and armor too massive for simple cars and trucks make these plated horrors more than a match for anything in any arena. Tanks are the true rulers of the road — and anywhere else! The military battlefield is incredibly lethal and complex. Infantry equipment, hidden movement and spotting, electronic warfare and artillery rules portray a battlefield where the average Car Wars car has a lifespan measured in seconds. Only the mighty survive — Tanks. Car Wars Tanks is a supplement to Car Wars, You must have the Car Wars rules to play." CONTENTS: Rule booklet * 2 battle maps * sheet of counters. "If you thought the roads were tough in 2040, you ain't seen nothin' yet. 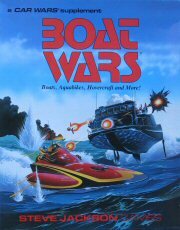 Boat Wars takes the action and excitement of Car Wars off the land and into the water! This supplement gives you complete, official rules for movement, combat and construction of boats and hovercraft. Included are full-color counters for all the vehicles in the game, and a large blue-water map to play on. Boat Wars is a Car Wars supplement (you will need Car Wars or Deluxe Car Wars to play). • Over 100 full-color counters for boats and hovercraft, and a ziplock bag to hold them. • Two boat turning keys and other movement templates. • Four geomorphic 21"x32" map sections, showing safe channels, islands, and the tricky water in between. 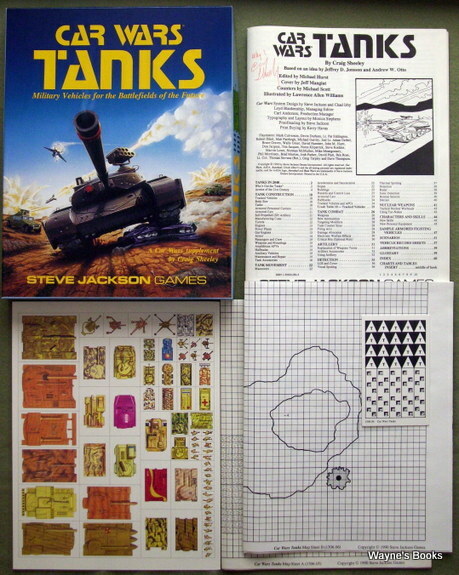 • An expanded 8 1/2" x 11" rulebook. • Sharks of all kinds, and other aquatic menaces. • Aquabikes - the smallest speedsters afloat! • Plenty of new counters. • New gadgets... explosive duck decoys... and more!" • Two full-color counter sheets, with everything from one-man jets and autogyros to behemoth airships and military bombers. • Two 21"x32" airport map sheets with an aircraft hangar, anti-aircraft bunkers, control tower and other features. The backs are printed with blank grids for air-to-air combat or for you to customize. "The cars rule the roads and the boats rule the lakes, but everyone scatters when the aircraft roar across the battlefield! 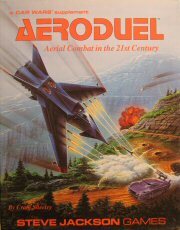 Aeroduel introduces air power to Car Wars, with complete rules for the expensive but ultra-deadly aircraft of the 21st century. Included are official rules for construction, movement and combat for everything that flies — airplanes, ultralights, airships, helicopters, gliders, autogyros, balloons and even jet packs!" Contains: Small counter sheet, two 21" x 32" maps, rules & scenarios in cover sleeve. Contains: Small counter sheet, two 21" x 32" wilderness maps, rules & scenarios in cover sleeve. "14 arenas for Car Wars battles. 3 are detailed on 2 huge fold-out maps removable from the centerfold." 3-panel screen with sheet of tables. 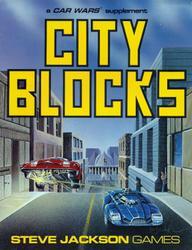 "It's the all-new Car Wars City Blocks! Give your duellists a new town to blaze through each time you play. Use the 32 geomorphing map sections to set up countless cities. The 8" x 8" blocks give you ample room for pedestrian ambushes as well as screeching car chases. Add waterways, landscaping and narrow alleys to your driving adventures. Don't be predictable — be creative! Let Car : Wars City Blocks help you drive offensively! Create your own city or follow this diagram. Trim away the white borders from the 8" x 8" blocks. Separate the road sections, waterways and obstructions -- and let your imagination run wild! 32 — 8" x 8" city blocks; additional road sections; obstruction counters and waterways"
Trim away the white borders from the 8" x 8" blocks. Separate the road sections, waterways and extra counters — and let your imagination run wild! 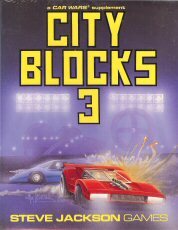 32 - 8" x 8" city blocks; extra craters, oil slicks and smoke counters; additional road sections and waterways"
"Car Wars City Blocks 3 - Arena! No more plain vanilla raceways; you can customize your own arena. This set lets you build up to a 48"x40" or 64"x32" arena. Add ramps, overpasses and underpasses to challenge the daring. Increase media coverage and prestige with TV, bunkers. And, for those unlucky duellists, scatter a few pedestrian bunkers and bolt holes. 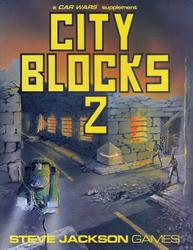 Capture the true adventure of autoduelling at its best, with Car Wars City Blocks. Contents of this set: 32 - 8"x8" arena blocks - 4 corners; 4 Gateways; 12 Wall Sections; 12 Floor Sections plus ramps; obstruction counters and bunkers." 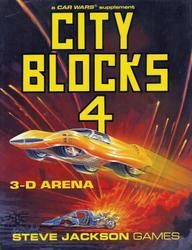 Car Wars City Blocks - 3-D Arena! This set lets you buildup to a 32"x24" arena and fill it with three-dimensional ramps, bunkers and overpasses. Or combine it with City Blocks 3 - Arena and use the extra inner and outer corners to make bigger/ more elaborate layouts - up to a 72"x 40" arena! Contents of this set: 26 8"x 8" arena blocks - 4 Outer Corners, 4 Inner Corners, 6 Wall Sections, 12 Floor Sections plus 3-D Ramps, Bunkers, and Overpasses, and extra counters." "Car Wars is the game of the freeways of the future — where the right of way goes to the biggest guns. Choose your vehicle — complete with weapons, armor, power plant, suspension, and body style. Then take it out on the road. You'll come home an "ace" — or you'll crash and burn. If you survive, your abilities will improve, and you can accumulate money to buy bigger and better cars. Now, all your Car Wars rules can be found in one book — The Car Wars Compendium. 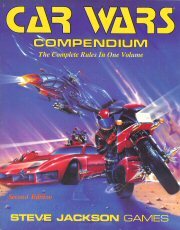 Included are the rules from Car Wars Deluxe Edition, Boat Wars, Dueltrack, and the Uncle Albert's Catalogs through 2039 — as well as clarifications, improvements, and new rules from the pages of Autoduel Quarterly, streamlined for faster play. Design your own cars, cycles, trikes, vans, trucks, 18-wheel tractor-trailer rigs, boats, helicopters and hovercraft! 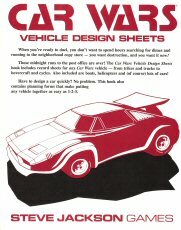 The Car Wars Compendium is organized and indexed for easy reference, and includes 8 extra pages of charts and tables! NOTE: This is not a complete game. You will need maps and counters from Deluxe Car Wars, Boat Wars or other Car Wars supplements to play." "Midville, Ohio used to be a nice, sleepy little Middle-American town. But that was before the cycle gangs came . . . and left just as quickly with their tails between their legs! Now it's one of the most famous towns in America, thanks to UBN's hit show, Crash City. And all the Crash City fans are showing up to see if Midville is really "The Toughest Little Town in America." Midville is a city with a rep to protect — if you're a visitor, you'll get the right hand of friendship extended in a neighborly fashion. But if you're a biker, or anyone else bent on causing trouble, you better watch out. The MONDOs are the toughest neighborhood watch team this side of the Texas Rangers! 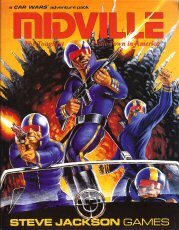 But if you're looking for action, Midville is the place. If it isn't an over-exuberant Crash City fan shooting up downtown, it's a full-scale battle between MONDOs and whoever happens to be closest! • Four 21" x 32" maps, which can be used on their own or with maps from Car Wars Deluxe Edition or Boat Wars. • An 8" x 10" full-color counter sheet containing everything from duelling teams to city vehicles"
• The new Control Table on the back of each vehicle sheet! This new chart is the most up-to-date available, and conforms to the Car Wars Compendium, Second Edition! • The appropriate Crash Table for the vehicle on the back of each record sheet! • The new Five-Phase Movement Chart is featured on the back cover for easy use!" "You've got the perfect arena in mind - ramps, pits and lots of spiky things that go boom! But how do you design it? 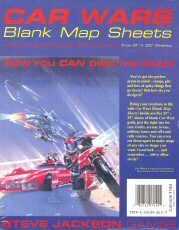 Bring your creations to life with Car Wars Blank Map Sheets! Inside are five 21" x 32" sheets of blank Car Wars grids, just the right size for race tracks, arenas, towns, military bases and off-road rally courses. You can even cut them apart to make maps of any size or shape you want. Good luck ... and remember... drive offensively!" And escape — driving through the worst urban jungle in North America! From the Psycho-Delics to the Slimes, every gang in the city will be out to kill you. Be ready to deal with hostile cars, choppers — maybe even tanks — to win your way to freedom through Houston's Mean Streets. 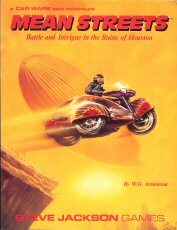 Mean Streets is a programmed adventure for Car Wars. 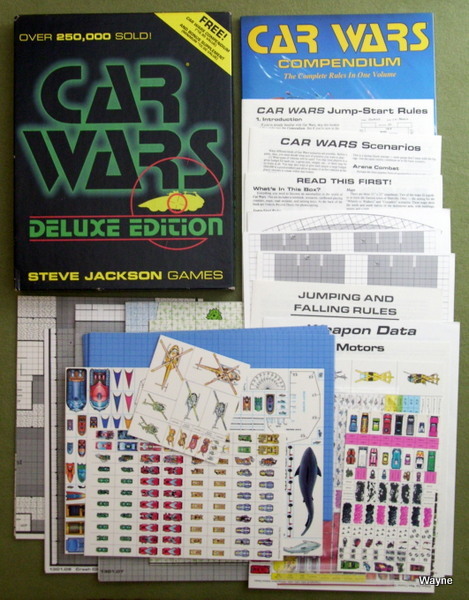 You should have the Car Wars Deluxe Edition, or the Car Wars Compendium and a set of maps and counters. It can be played three ways: it As a solo adventure — no opponent needed. * As a two-person game — one takes the part of the agent, and the other runs the gang vehicles. * As a Game Master's guide to vehicles and encounters for a multi-player roleplaying adventure. Included are complete Car Wars stats for 18 different vehicles. Good luck, and drive offensively!" "Uncle Albert's tried it all — magazine ads, television, mail-order catalogs, even skywriting, To get his message of new inventions and the latest technology at the lowest prices to even more people, the Uncle Albert's Auto Stop and Gunnery Shop crack marketing department has decided to try an old stand-by from the good old days — the promotional calendar. Although presented as a 2038 calendar, complete with "historical" dates from 1981 to 2038, this calendar is actually a correct, complete, and fully functional 1988 calendar. The months and dates are all correct for the year 1988. Hang it on your wall! Impress your friends! Confuse your enemies! IT'S A CAR WARS SUPPLEMENT! Each month features new Car Wars gadgets from Uncle Albert's Auto Stop and Gunnery Shop! Complete game stats are given for each item, and each item is "official" in the Car Wars game system. No fair peeking, though — an item becomes official on the first day of the month it is featured, and not a day sooner."